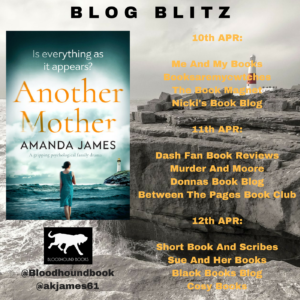 I’m very pleased to be sharing my review of Another Mother by Amanda James today as part of the blog blitz. I’ve been meaning to read one of Amanda’s books for ages and I wasn’t disappointed. Thanks to Sarah Hardy of Bloodhound Books for the review copy and the place on the blitz. Adopted at birth, for years Lu has secretly dreamt of finding her birth mother but childhood bullying has left her with a lack of confidence. When a tragic accident changes her life forever it sets her on a mission to get in contact with her birth mother and find out the reasons behind her adoption. When she tracks down her mother in Cornwall there is an emotional reunion and the pair begin to form a relationship. But is everything as wonderful as it appears or has Lu walked into a nightmare? 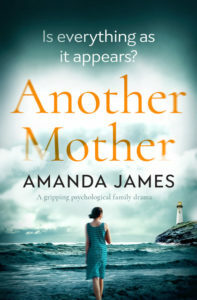 Another Mother is available now in ebook and paperback. Is blood really thicker than water? Lucinda Lacey isn’t sure. Her adoptive mother has died in a tragic accident and she feels compelled, now more than ever, to try to find her birth mother. Her search leads her to Cornwall and to quite a bit more than she expected. Another Mother is told almost completely in the first person by Lu. We witness her sadness at the loss of her mum and her dad’s inability to deal with it. Feeling like she needs to do something more meaningful with her life leads her to take the steps she does in tracing her birth mother. In setting off for Cornwall she leaves behind family friend, Adelaide, a character who I really took to. She’s a no nonsense sort but an absolute rock to Lu and her dad. But she does meet a new friend in Cornwall, Rosie, who’s a really lovely, fun person for Lu to be around. This book surprised me a little. I was expecting something very gritty, but it turned out to be more of a family drama until nearer the end when the tension moved up a gear. It’s a bit of a hybrid – a psychological family noir perhaps. I raced through Another Mother, finishing it within a day. It’s a very easy book to read, full of emotional twists and turns. I never knew where this suspense filled book would take me and I found it to be quite a thrilling read. Amanda grew up in Sheffield but now has realised her lifelong dream of living in Cornwall and her writing is inspired every day by the dramatic coastline near her home. She has sketched out many stories in her head while walking the cliff paths. 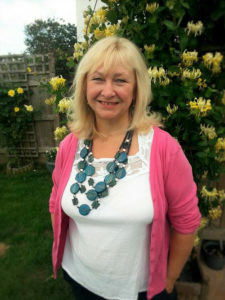 Three of her mystery/suspense novels are set there, Somewhere Beyond the Sea, Summer in Tintagel and the Behind the Lie. Rip Current is also set in Cornwall and will be published by Bloodhound Books in April 2018.